All are shaped by the promise and deceit of history, have our identities enhanced or reduced by day-to-day living. Those with ambition to shape the future go further and sacrifice their identities completely. Ramon Mercader hardly survived what happened to him after he killed Trotsky. The man was reduced and changed. He thought he could become a hero but became notorious as a villain. In this outstanding novel, Padura insists that Mercader was both victim and responsible. Complex identity means we never can be certain about culpability. Ramon Mercader killed Trotsky and survived 20 years in a Mexican prison and a paranoid existence in the totalitarian Soviet Republic. His alternate disguises as separate identities misled others and himself. 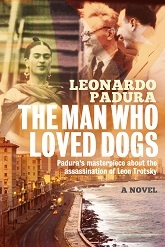 The Man Who Loved Dogs makes explicit how the utopian ideal of Communism was destroyed by the corrupt and powerful. Not only were people lost but also dreams. And so it goes. Not only has every Marxist revolution failed but even the modest gains of Social Democracy are now being overturned. This is the trap we face, and the novel argues that we do not know what to do and probably never did. Sacrificed dreams mean neither do we know who we are. Without anything left to believe in, all that remains is pretence and dogma. The Man Who Loved Dogs is not a pleasant read for those on the political left. It relentlessly recalls the tragedy inflicted by the cynical and the blind. But Padura is hardly providing succour to self-serving neo-economists. The world is at the bottom of a terrible trap. Indeed he makes a plea, if only briefly, for another revolution but, next time, one that insists on more democracy than we have, not less. One connection that is not made in a novel that brilliantly embraces the Russian Revolution, the Stalinist aftermath, the Spanish Civil War and the privations in Cuba is that between Trotsky and Jesse James. Both men were assassinated from behind, both were living secluded lives and both had political significance for the defeated in large societies that were determined to welcome and advance modernism. We remain curious about both doomed assassins. The victims, though, are secure in posterity. The racist psychopath, Jesse James, had been media whitewashed into celebrity well before the coward Bob Ford made his dialectical materialistic decision. But before his death Trotsky was already desperate with no alternatives beyond Mexico. As Stalin said, ‘A single death is a tragedy and million deaths a statistic.’ The assassination of Trotsky was not the greatest crime Stalin committed. But the destruction of individuals can symbolise universal loss and the wilful blindness of the powerful more effectively than a million anonymous victims. This is perhaps why Padura insists that the personal tragedy of his friend is connected to grand history elsewhere. Compassion for others is important above everything. It, and neither Marxist nor neo-conservative theory, is what needs to prevail. The Man Who Loved Dogs has been adapted for the radio by BBC Radio 4. Thanks to Bitter Lemon Press for publishing excellent crime novels from outside the UK. Posted in Uncategorized on November 15, 2014 by Howard Jackson.